Today morning I was trying to compare two files for some small differences. It was really very difficult to compare the files manually. So I was searching for some free software which can visually show me the differences and found WinMerge. WinMerge is an Open Source software which can be used for differencing and merging text based files. WinMerge can also be used to compare folders to show you the differences in a visual text format that is easy to understand and handle. WinMerge is really very useful for programmers and developers. WinMerge can be used for determining the changes between project versions, and then merging the changes between versions. 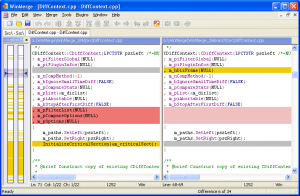 WinMerge can also be used as an external differencing and merging tool. The simple interface will definitely help you to use it very effectively even without reading the manuals. The differences between the files are highlighted in color codes for easy analysis. It would have been very much better if WinMerge also provides a 3-way comparison. Efficiently handles Windows, Linux and Mac file formats. Flexible editor with color coded syntax highlighting, line numbers and word-wrap. You can use Regular Expression filters to include and exclude specific items. Visual SourceSafe and Rational ClearCase integration. I should agree with you this tool is a must for those who are working with files and doing some comparing or merging. I use this at office everyday.